A new version of the React Apollo client has been released. Learn how to use the new API in this fullstack tutorial. Render props have seen a big hype in the React community lately. Last week, Apollo introduced a new version of their React client, now making use of this new pattern that allows to reuse code among React components. In this fullstack tutorial, you will rebuild the React & GraphQL fullstack boilerplate project and learn how to use Apollo’s new API. You can find the final version of the code on GitHub. Render props are a pattern to share code between React components using a prop whose value is a function. In general, render props enable code reuse and therefore are often used as an alternative to React’s higher-order components (HOCs). It should also be noted that while React Apollo 2.1. introduces this new render props API, you don’t have to use it. You might very well keep on using the good ol’ graphql HOC the same way you did before. So, when to use which? Generally, the new render prop components Query, Mutation and Subscription tend to be simpler and more straightforward to use than the HOC counterpart. This is mostly because they are being used like any other React component and can just be included in your JSX code with corresponding tags (e.g. Query). Higher-order components always require another level of indirection in that your React components need to be wrapped with the HOC function. This can be less intuitive, especially for newcomers. Because of that, they also lend themselves for simple use cases, e.g. where one React component depends on a single query and mutation and therefore easily can be wrapped inside a Query or Mutation render prop component. Another great use case where the render props components might come in handy is when a component uses multiple queries that depend on each other. This can easily be implemented by nesting the Query components inside each other. If you’re already comfortable with using HOCs you might not feel the need to use the new render props API. In the end, it very much depends on your personal preference as both the graphql HOC and the new render props component provide the same functionality. Consider the new API as another tool in your toolbox to help structure your application in the way you like. This article is not about render props per se. If you want to learn more about them and why many developer prefer using render props over HOCs, make sure to read this article by Michael Jackson. 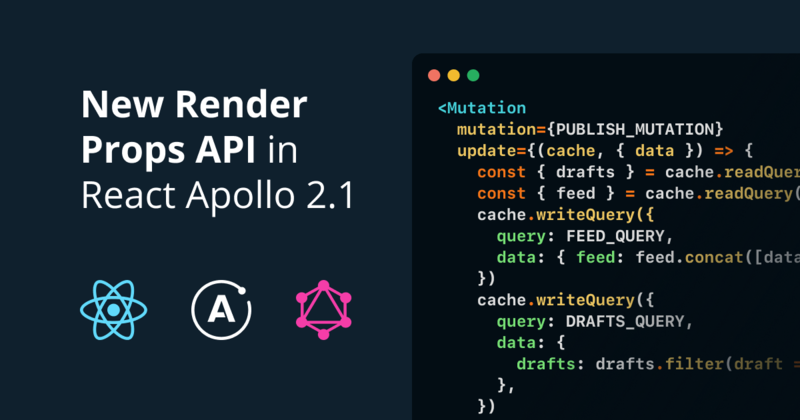 In this section, you’ll prepare everything to get started with the new render props API of React Apollo 2.1. If you don’t want to actually follow the tutorial but only want to read about the new render props API, feel free to skip ahead. This downloads the code from the starter branch of this GitHub repository and puts it into a new directory called react-apollo-tutorial-starter. Feel free to make yourself familiar with the codebase. You can start the app by running yarn start inside the react-apollo-tutorial-starter directory. Don’t forget to install the dependencies before by running yarn install. The directory you downloaded already contains the entire UI for the app, but there’s no actual functionality because that all depends on the backend. Speaking of the backend, the code for the GraphQL server is located inside the server directory. 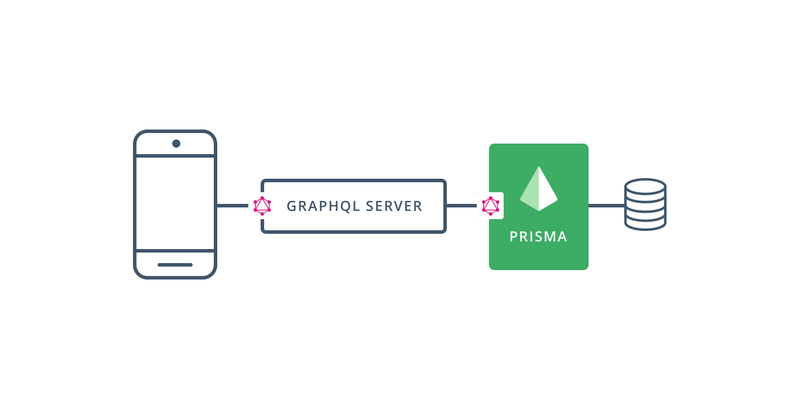 Check out server/src/schema.graphql to see the GraphQL schema of the app and learn what API operations are supported. You can start the server by running yarn start inside the server directory (again, don’t forget running yarn install before). 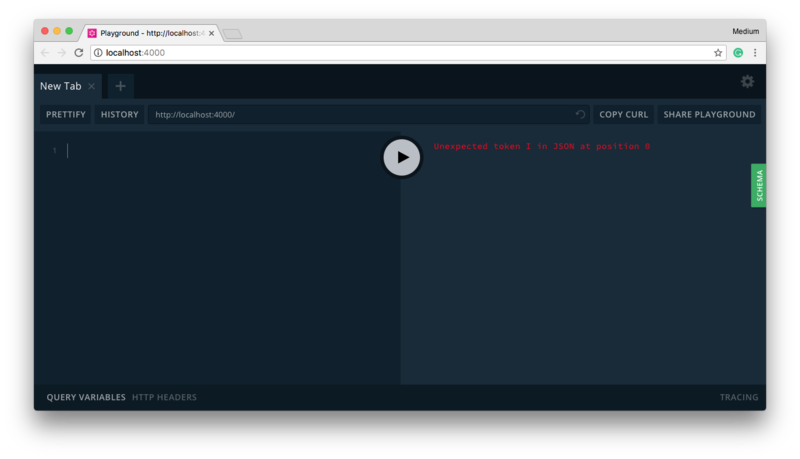 Once the server is running, you can open a GraphQL Playground under the URL http://localhost:4000 (this also is the endpoint your frontend will connect to) and use it send to queries and mutations to your server. To learn how you can deploy the GraphQL server to the web, check out the previous tutorials on our blog. 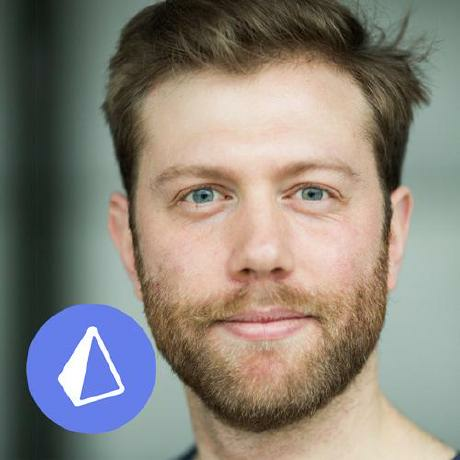 There are tutorials for the one-click deployment tools Zeit Now and Apex Up. 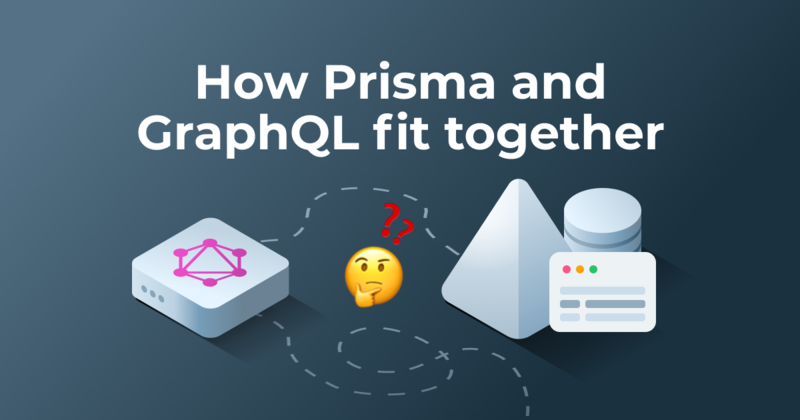 This is because the GraphQL server depends on a Prisma service as its database layer, but you haven’t deployed that Prisma service yet. So, that’s what you’ll do next. If you have the Prisma CLI installed globally on your machine (which you can do with npm install -g prisma), you can omit the yarn prefix which invokes a script from package.json and simply run prisma deploy instead. 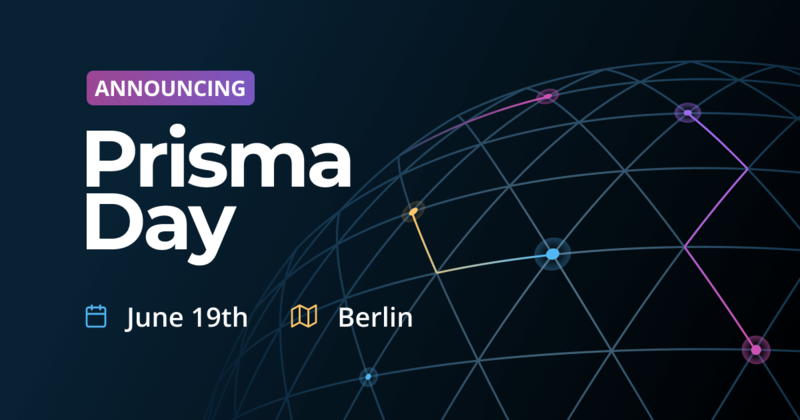 After the command has finished, it outputs the HTTP endpoint of your Prisma service. It will look somewhat similar to this: https://eu1.prisma.sh/public-warpcrow-598/blogr/dev where public-warpcrow-598 is a randomly generated ID that will look different for you. Note that this command also seeded some initial data in your database, based on the mutation defined in server/database/seed.graphql. That’s it! Your GraphQL server is now backed by a database and fully functional, so you can start sending queries and mutations in the Playground. If you want to learn how to build the GraphQL server that’s used as a backend in this tutorial, you can read this tutorial. Note that apollo-boost is a wrapper package that lets you get started quickly with Apollo Client without much configuration overhead. At this point, you can start writing actual code! 🙌 The first thing you need to do is connecting your frontend with the backend by creating an ApolloClient instance with the endpoint of your GraphQL server. As mentioned before, ApolloClient will connect to the GraphQL server that’s running locally on port 4000.
className="link dim f6 f5-ns dib mr3 black"
Thanks to the ApolloProvider, you’ll now be able to use Apollo Client’s functionality inside your app. You’ll start by implementing the functionality for the /drafts route that can be found in the DraftsPage component. To load the drafts from the backend, you need to use the drafts query defined in the server’s GraphQL schema. Note that you’re only exporting the query because you’ll need it later in a different file when you’re updating the cache after a mutation. If you run the app now, the DraftsPage will already load the data from the server. Don’t forget to have the server running (by calling yarn start inside src/server) whenever you want to test the app — otherwise the app misses its backend and won’t work! All right, so the now the app load and displays the data. But what happens if the network request fails for some reason? Also, you probably want to display a loading state to your users while the request is ongoing. Thanks to Apollo, this functionality is super straightforward. The render prop function not only receives the response data as input arguments, but at the same time also an error object as well as a boolean value loading that is true as long as the server’s response hasn’t been received. 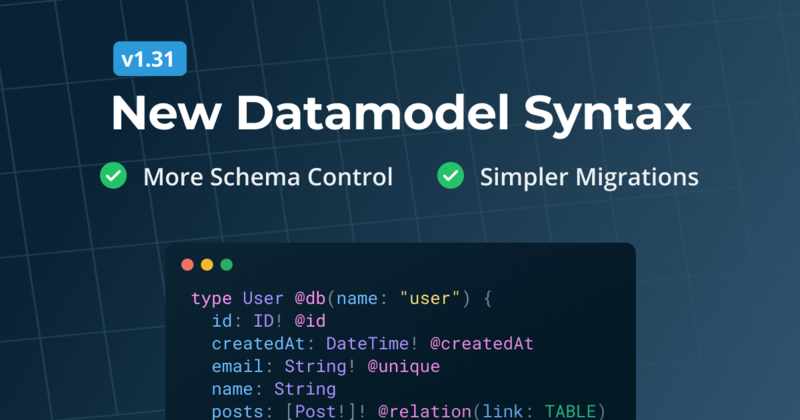 If you’ve worked with earlier versions of Apollo, this API will feel familiar to you. It basically is the same as the one that’s used for the graphql HOC (where Apollo injects data, loading and error into the props of the component that’s wrapped with graphql). That’s it already for the drafts page! 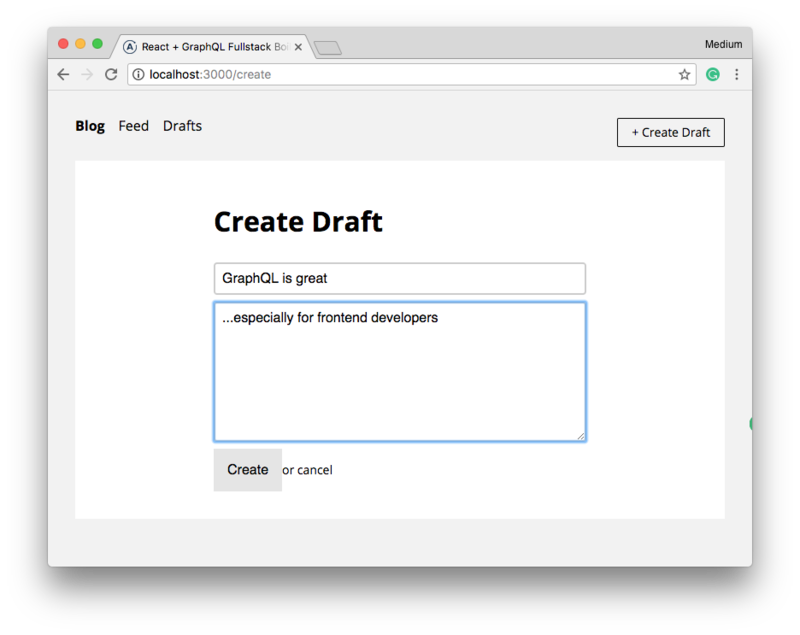 New drafts are created under the /create route which renders the CreatePage component. It shows a simple form with two inputs where the user can provide the title and the text for their new drafts. This mutation takes two variables which you’ll pass to it from the component’s state before it is sent to the server. The Query and Mutation components in React Apollo 2.1. are very similar. The core difference is that when wrapping another component with Mutation the render prop function also receives a function which you use the send the mutation to the server. The data, loading and error arguments that are being passed into the render prop function have the same semantics as the ones you just saw with the Query component. The very first argument of the function, createDraft, is used to send the CREATE_DRAFT_MUTATION to the server. It is being called in the onSubmit callback of the form element. The reason for this is that the drafts page only displays already cached data. To fix this, you manually need to update the cache after the mutation was performed. Apollo’s imperative store API allows to read and write directly from/to the Apollo cache. Again, if you’ve already used the imperative store API in an earlier version of Apollo, the following will feel very familiar to you. The big difference in the new version is that update is not passed as an argument to the function that performs the mutation, but instead passed as a prop to the Mutation component. The API of the update function remains the same: It receives an object that serves as an interface to the cache and allows to update it as well as the server’s response. Inside update, you first extract the previous results of the DRAFTS_QUERY from the cache (here’s also the reason why you previously needed to export it from DraftsPage). Then, you’re using writeQuery to update the the contents of the cache by manually adding the new draft object that was returned by the server (which is stored in data.createDraft). Great, when you’re testing the app again, you’ll see that the /drafts page is now updated directly after the mutation was performed. Note that we’re omitting accounting for error and loading states here for the sake of brevity. Whenever a post is clicked (either from the drafts or from the feed page), it will be displayed using the DetailPage component. This also loads the data for the post from the network. The id variable is passed to the Query component as a prop. It is read from the current URL which contain’s the id of the selected post. These currently don’t work, so let’s implement for them next! className="f6 dim br1 ba ph3 pv2 mb2 dib black pointer"
This code isn’t using any new concepts. The actual button is wrapped inside a Mutation component which receives the PUBLISH_MUTATION as well as an update function as its props. Inside update, the published post first is manually removed from the previously cached results of the DRAFTS_QUERY and then added to the FEED_QUERY. Also note that the publish function that’s passed into the render prop function is invoked whenever the button Publish-button gets clicked. The implementation of the delete functionality is very similar to the one of publishing posts. To keep this tutorial short, we’ll leave the implementation of that feature as an exercise to the attentive reader. If you find yourself lost, just check the final version of the project on GitHub. In this tutorial, you learned how to use the new API of React Apollo 2.1. This API is based on the new Query and Mutation components that are making use of the render props pattern for sharing code among React components. 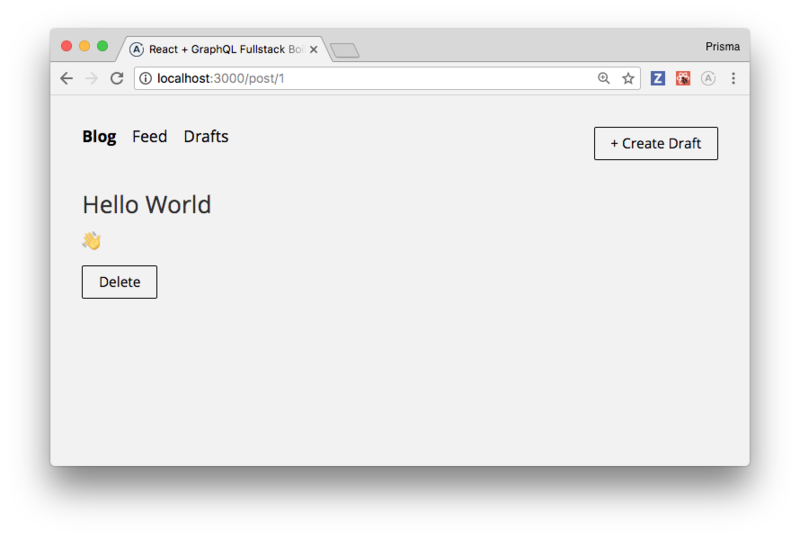 For the purpose of this tutorial, you rebuilt the basic boilerplate from the React & GraphQL fullstack boilerplate repository.